This is what the inside of my mind looks like when I’m first conceiving a story. I guess things actually start a little bit before this. Novels get conceived in a variety of ways and situations. Sometimes, unplanned stories happen. I’ve recently been conjuring up new story ideas from listening to The Physics of the Future. It’s very inspiring. I write down the little idea embryos and store them away in a cryogenic freeze until I’m ready to bear them. After the idea egg has been fertilized with some premise or characters, then it has to implant in my mind. 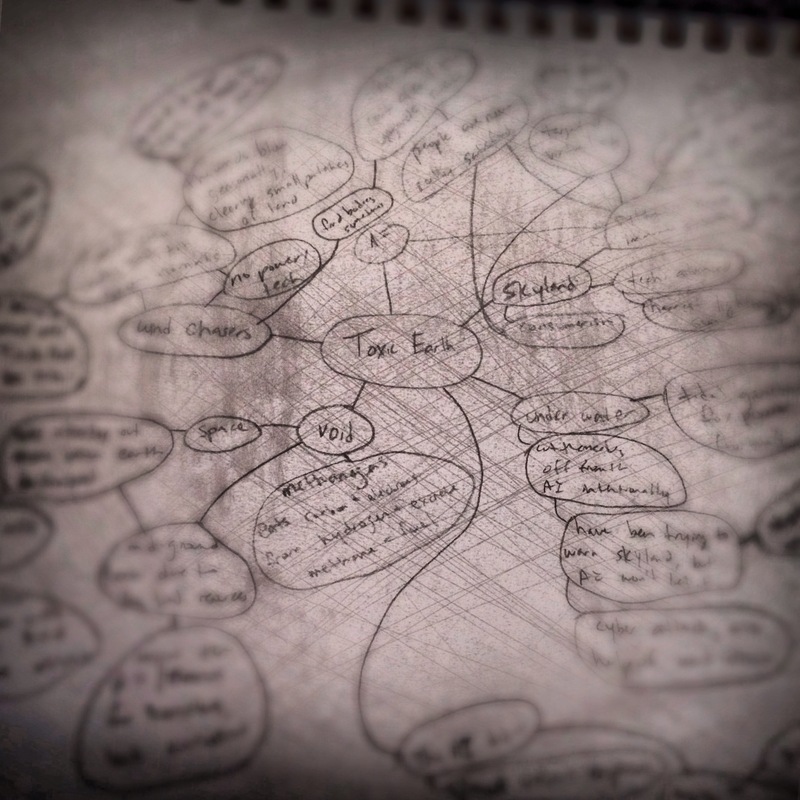 I’m a big fan of the mind map. I guess I’m a visual person, and this helps me connect the dots and see how my story comes together. I start with a central idea, the main topic or environment in my story, then I branch it out to smaller, but still important topics or characters. After that, I get deeper and deeper into detail. Sometimes I discover that something from character A actually goes with something from character C. It also helps me expand on my ideas. I’m usually not done until I’ve filled up the page. The next step for me is outlining. This is where the story-embryo becomes a story-fetus. Gathering up the gloopy word-cells into a familiar structure, that kind of looks like a story, but isn’t completely formed. I wasn’t always a fan of outlining. I liked not knowing where my story was going. I thought it made it feel more exciting. But then I’d write myself into a corner, and have no where to go. Then I tried outlining. It was amazing. It was exciting. I knew exactly where my story was going. Since I don’t have to think about that while I was writing, my mind is free to construct better. I can see the whole scene. I can watch it unfold without distraction. Next step is writing. We’ll call this the second trimester of the story. This is the point where it really comes together. Our story has a face, ten toes, we know if it’s gender, whether a mystery or a fantasy, or something else. At the end of this time, when the first draft is complete, it could go out into the world and survive on it’s own. It’d be a struggle, and it’d be behind it’s peers that got multiple drafts, but technically, it could survive. Probably not thrive, though. It’d be premature, probably a bit small, and underdeveloped. It’s tempting to say, yes, I’m done. Now get this word baby out of me and into the world! But just wait. You’re not done yet. You’ve got to do some revisions and edits on that thing before you can birth it. I know, it looks like a book. But it needs more time. Rewrite it again and again, until it’s something you can be proud of and think is the most beautiful thing, no matter how ugly it might actually be. Now is the time to deliver. You’ve spent months, maybe longer, bringing this novel to fruition. You’ve possibly lost your figure or your mind, but in the end, you know it’s worth it. There are a few options for this last step. You can have a home birth, choosing to self-publish. Or go the traditional route where Dr. Agent will help you bring your book into the world. Whatever option you choose, just be sure it’s the right one for you. Eventually, you have a novel of your very own. You will love it unconditionally. You will be so proud and amazed that you could create such a complex thing. If you print out a copy, you’ve got a little piece of yourself that you can hold in your arms.